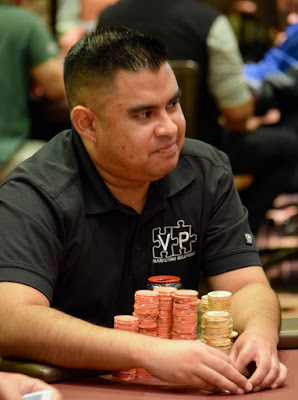 @TurlockPoker regulars made a big showing here in the Catapult, with more than a half-dozen of them making Day 2. Victor Paredes (above) moved all-in from the SB for his last 346,000 to an open and a flat in front of him. His two challengers both call, turning over KQ and QQ, respectively. Paredes shows Aces, the board runs out Jack-high and Paredes becomes the 2nd player to a Milly today.